UW-140-TAN | UltraSoft Arc/FR Bib Overall | AGO Industries Inc. Chest Width: Measure from side seam to side seam across the chest. 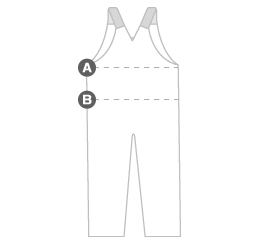 Waist Width: Measure from side seam to side seam across the waist. Chest Width 19.5" 21.5" 23.5" 25.5" 27.5" 29.5"
Waist Width 20" 22" 24" 26" 28" 30"